Every quarter the JSE indices are rebalanced to reflect their characteristics. With each rebalance, some companies could be removed from an index with others taking their place. An important impact of index rebalancing Is that tracker funds that are tracking the index, need to rebalance accordingly to stay in line with the index. This results in selling pressure on the companies being removed from the index and buying for new additions. This effect has increased with the popularity of passive index trackers. The index rebalancing rules for the Top40 index state that, when ranked by free float adjusted market cap, companies ranked smaller than 45th within the ALSI on the ranking date will be deleted from the Top40 index and companies ranked larger than 36th will be added to the index. Based on the 22nd November’s closing prices, MEI would be deleted from the Top40 index and PSG would be added to the index on the rebalance date. 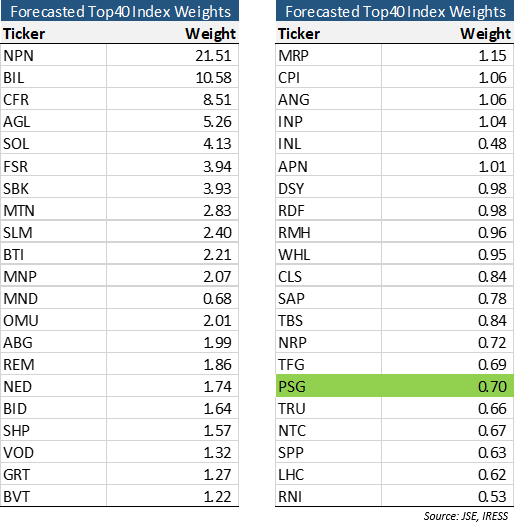 The table below shows the forecasted Top40 index weights after the index rebalance with PSG contributing 0.7%. Note: The weights in the table are only estimates based on the 22nd of November’s closing prices. The final constituent list, free floats and SII will be released by the JSE on 7 December 2018. In a previous article, some discounts in the market were identified and could prove to be useful if you are looking to rebalance your portfolio as well.